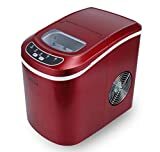 Our Della Portable ice maker review will give you a description of the product, its primary features, how it works, opinions from users, and lists of what we liked and didn’t like about it. This ice maker is suitable for households or offices. The Della portable ice maker has a stainless steel frame that provides durability without adding a ton of weight to the product. It comes in at 28 pounds in total. That makes the Della portable ice maker easy to transport when you need it elsewhere. It is 14.5 inches long, 9.75 inches wide, and 12.75 inches high. These dimensions make the machine small enough that it won’t take up much space on the counter. Best recommended for: The Della portable ice maker definitely has a household feel to it. It’s the perfect machine for making a few batches of ice for a small party or a family. However, while it is not an industrial-grade ice maker, it will be just the one needed in an office break room as it will on a kitchen counter. The machine creates a small batch of ice quickly. If that’s not enough, you can store additional ice to make sure that a room full of colleagues will always have some at hand when they need it. We can recommend the Della portable ice maker for both households and small office spaces. The list in this section contains some of the main features of the Della portable ice maker. You will also find some details about how it functions here. Stay tuned, we will take you through how it operates in a later section. The features you see here are some of the ones that we feel make the Della portable ice maker worthy of your consideration. This ice maker isn’t flashy. Therefore, it should match any home or office decor with ease. Most users report that it is easy for one person to transport the Della portable ice maker when necessary. It can start making its first batch of ice in as little as six minutes. The ice maker will alert you if it is starting to reach its maximum storage capacity. You can use it to make up to 26 pounds of ice in a single cycle. It has ETL, UL, and CSL certifications. The control system is simple and intuitive. It includes an ice tray for transporting cubes. An insulated reservoir can hold up to 1.5 pounds of ice in storage. The machine makes bullet cubes that are somewhat softer than traditional cubes and great for keeping drinks cold. Many users say that it can make eight cubes within 10 minutes. We noticed the intuitive nature of the Della portable ice maker almost instantly. The buttons are on the front of the machine, and you can turn it on or off with one button. Another switch will let you select the cycle or cube size you want. After you plug in the Della portable ice maker, it should start making its first batch of ice in as little as 10 minutes. On the other hand, this ice maker doesn’t operate as a freezer. Nonetheless, its insulated storage compartment will keep excess ice from melting too quickly. Make sure you fill the water reservoir before starting the machine. The reservoir will beep at you when it is time to fill it with more water. You can turn this feature off if you have enough ice to meet your needs or simply turn the machine off entirely. Most users appreciate how quickly the Della portable ice maker will produce ice. It can start making ice for your needs just a few minutes after you unbox it. Several users claim that this machine is sufficient for producing enough ice for a small or medium-sized family. The storage reservoir should keep your cubes cold for at least a few hours. Many customers are pleased that the unit runs quietly. In rare cases, some users said it took a long time to make enough ice for a cooler. Others reported that the Della portable ice maker may get progressively louder as it starts to fail. Therefore, we recommend listening for extra noise coming from the machine and contacting customer care if any changes occur. Overall, we feel we can recommend this product to anyone that needs a consistent means of ice production for a small group. The Della portable ice maker has high value for its cost. It is covered by a manufacturer’s warranty for one year. You should not have any trouble using this machine because there is no learning curve. It does not create excessive noise in the home or office. One person can transport it without any trouble. It can create a lot of ice in a single cycle. Extra ice should be good for several hours. It won’t take up much space on a counter. A few users raised some concerns about this Della portable ice maker. While the unit does keep extra ice cold, it is hard to tell precisely how long it takes for the ice to melt. In addition, there appears to be little variation in size between the small and large cubes. Some users said their ice machine asked for more water in the reservoir even when it was full, but this error usually went away after they unplugged it. A close look at Hawaiian Shaved Ice Machine S900A model that will grant your summer wish for slushies and snow cones. Our latest list with the best small ice makers for office. If you want a versatile ice maker that is useful in both home and office settings, the Della portable ice maker is definitely worth a look. It will produce a lot of ice consistently and keep it cold until you need it. Please share your thoughts on this unit with us in our comments section.